For those of you who are wanting to purchase one or more items from Jackson Hole Tim please note we have updated our payment gateway. In order to simplify the purchasing process and experience we have now the PAYPAL payment gateway. If you have a PayPal account you can choose to login to your PayPal account and process your purchase based on your account preferences. If you do not have a PayPal account or you simply want to pay using a credit card of choice you have the option too. You can also choose to pay by credit card on the checkout pages in place of the PayPal gateway. Shop as a guest on Jackson Hole Tim or create an account Online which allows you to come back, visit, shop and login. If you do not have a PayPal account you may want to consider creating one – it’s FREE. PayPal is a very solid secure payment gateway to process your Online orders. We hope you find the checkout process here on Jackson Hole Tim a simplified one. If you have questions about product, shipping options or you just want an updated quote give us a call (307) 690-0427. Now let’s shop! After carefully reviewing hundreds of images I have select these 7 new images to add to our Greeting Card Collection. This brings the choices to a total of 16 cards in all. Again these are 5×7 Folded format cards with envelopes. Each card will ship with their own protective clear sleeve. $3.85 per card plus shipping. Black Walnut Drone flute enters finishing stage. This flute has gone through a long journey and it should be completed in the coming week or so. This Drone flute features 1″ inch bores and had been tuned to D @444Hz per request of a previous interested party. This flute will be included in our farm gallery inventory when complete. The fetish has been hand carved from a single piece of Black Walnut and features an arrowhead theme. Leather for the fetish will be hand cut bison lace – probably in a dark brown color. There are no additional accents at this time on this flute other than the hand carving seen here on the top of the flute. The bottom of the drone is smooth across the entire bottom. There is a subtle elevation separation at the mouth piece that should help ones ability to play one side or the other or both. This flute is to be finished with a high gloss lacquer that should really make it pop. The walnut coloring is pretty much a traditional walnut look and feel and although a drone it is fairly comfortable in your hands. A recording should be available shortly of how this drone sounds and plays. The entire construction of this flute was done by me by hand. This flute is available for purchase at this time. Current plans are for a high gloss lacquer finish. There is still time to add any additional accents, select the finish for this flute, add feather or horse hair accents, add stones for a higher price point PRE-COMPLETION PRICE: $895 PLUS $16.95 Shipping (lower 48 states). NO additional accents. To add additional accents please contact me for pricing. DEPOSIT REQUIRED for changes. After completing several of these Mustang fetish/totems I have decided to craft in advance several of these new Mustang Fetishes for those of you who may want a new totem for an existing flute. These will be fully completed fetishes. 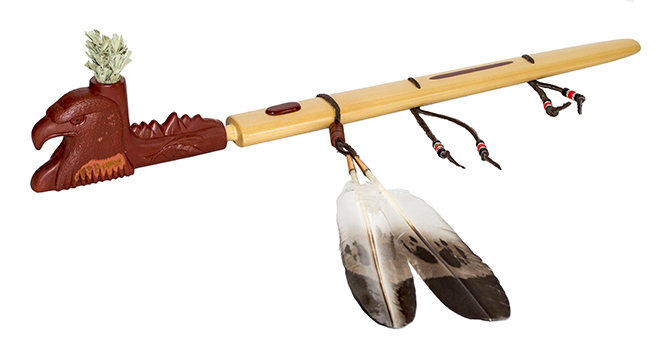 Designed to work with a Native American Style Flute that has the focusing channel crafted or cut into the body of the flute. Is is best suited for a larger bore flute of 7/8″ or better as this totem is a bit on the larger size. The image in above was an 7/8″ Bore flute made for a customer in Cave Creek Arizona. People seem to really like this totem so I thought I would build 3 or 4 on spec. This totem/fetish will feature a chimney and the standard width is 3/8″ with a depth of around 7mm. If you have a larger bore flute that has a larger windway area please contact me so we can match them up. For example – a 1″ bore flute although typically will have a 3/8″ wide windway are it can be as wide as 1/2″ and still be correct. The chimney needs to match your flutes windway as close as possible so it plays correctly. The first three will be crafted from an old growth block of Maple. 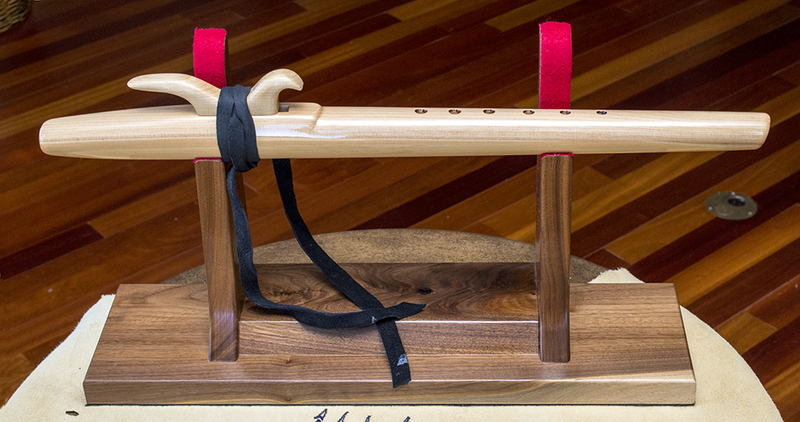 The image that sits on the Port Orford Cedar flute above was crafted from this same block of wood. Each of the totems I will carve will not be finished until I know who will purchase one. Some like their flutes and totems to be oiled and other like a lacquered so the call will be yours. Any fetish purchased will be shipped with a generous amount of 3/8″ Bison leather so you can attach it immediately to your chosen flute. This is a fairly labor intensive totem so if you have any interest in purchasing one of these Mustang Fetishes please reach out to me by phone or email. This fetish can also be crafted in other wood species if you are looking for another color pattern. Price point will be determined on finish and species of wood selected. If these are available when finished I will price them accordingly at that time. Call or text me at (307) 690-0427 or email me at Sales@Jacksonholetim.com. Currently under construction this is going to be a beautiful 1 inch bored flute. Tentative tuning will be a D @ 440 Hz. This flute will feature Black Walnut fetish guide rails and an inlaid cutting edge also in walnut. Overall length of this flute should come in at 27 1/2 Inches measured on top. This flute has a fundamental note of D @ 440 Hz but could be changed if you hurry. Plans to finish with a high gloss lacquer but this too could be changed if you are interested in this flute. Progress for this flute can be found in our UNDER CONSTRUCTION LINK found in our menu system. If you are interested simply email me at “sales@jacksonholetim.com” and reference this flute. Or call me at 307-690-0427. Price for this flute has yet to be determined… still time to make it your own. This is a post for a flute I just finished re-working and sent back to a client. It came to me as a C# and we changed it to a D @432Hz. This is a flute I made several years ago for a client in Idaho and when it came back to me I immediately saw some things I wanted to change. The eagle fetish now placed on the flute was one she purchase from me a year ago for another flute and she wanted to use it on this flute along with the feather fetish originally created as you can see in the photo below. We did not put a finish on the flute originally by request nor did we this time after reshaping. If you look closely at the original photo below you will see that this flute was a bit on the big side and with a 1″ bore a C# is really not the best key for it. So I re-tuned it to a D @432Hz. This flute sounds a lot better and plays really nice. I had to make some adjustments to the eagle fetish chimney so it would not interfere with the flow of air. The image above is the same flute after re-working it. Much more slender, hand carved signature step in front of the windway and a much tighter mouthpiece. I did not change anything in the length of the flute nor did I adjust the playing holes. All tuning was done using an undercutting technique. I only hope she is pleased with the end result. Building your own flute is a journey within reach for everyone who has the ability to use their hands. The Native American Flute is one of the most pleasant-sounding wind instruments to play and one that anyone who has the interest and desire to play can learn. Building your own flute whether it be for personal satisfaction or because you want to build them and sell them to the public is truly a satisfying endeavor. Not everyone one has the space, time or money to have a workshop that allows you to create the supplies you will need to build your own flute. Artist Timothy Jennings has worked for many years providing flute makers all over the country with some of the best quality old growth specialty wood flute blanks to help you complete your flute project. Most of the wood Tim uses is indigenous to North America, with very few exceptions. All the leather accents he uses to craft his flutes come from hand selected Buffalo and Elk hides and this same material is available for purchase on this website. Save yourself some time, money, and space by ordering from Tim Jennings @ JacksonHoleTim.com you may just find just what you need for your next flute project. Earlier this year I was contacted by a very special man, Jesse-Blue Forrest Sequoyah-Blue Deer Eagle who reached out to me to commission an eagle pipe that would be used in ceremony over several years as this pipe was to take a long journey across Canada on what is now known as the Tree of Unity Peace Walk. Once I had accepted this commission which was and is a great honor, I knew I had an important task set before me. As I pondered the path I would take to craft the sacred pipe that was to be an Eagle pipe I for some reason decided to start two pipes at the same time, one of which is the pipe you see before you here and the other at the top of this post. It was made very clear to me the importance of the commission I was about to undertake and the very next day I started on the journey with great passion – a journey that would end with two pipes. The most important task was to complete the Tree of Unity Peace Walk pipe then I could focus on the second pipe to follow which I am calling “Anukasa and the Range – Nakhota, Alliance of Friends”. This eagle pipe will be seen by thousands of people at the upcoming Western Design Conference to be held this weekend here in Jackson Hole Wyoming. I am hoping to share a small glimpse into the world of the Sacred Pipe by way of display. As many of you know I live in Jackson Hole Wyoming, home of the Teton Mountain Range, known worldwide. This powerful mountain range rises above the Teton Valley and it is the Southern Gateway into the Yellowstone Basin. Les Trois Tetons it is believed was the name given to the mountain range by the Iroquois or French Canadian trappers in the very early 1800’s. Since then these majestic peaks have been called by many names. It is a very rare event that I trek north of Jackson Hole when I do not see one or more Bald Eagles soaring around the valley and into the base of these mountains. When you see the majesty of these magnificent birds and how they interact with Mother Earth and her ranges it is clear there is an Alliance of Friends or another way of saying it is Nakota or Nakhota which are names used to describe today’s Assiniboine First Nations People. So why use this translation and not something else? Well truth be told all of the Sacred Pipestone I receive comes from a single family who are Assiniboine descendants and they live on the Assiniboine Reservations located in Northeastern Montana. Donovan Archambault is my Assiniboine Elder Mentor, a Master Pipe Maker in his own right. Each summer Donovan and younger parts of his family travel back to their ancestral region in Minnesota to hand quarry the sacred stone from Mother Earth. It is then hauled back from Minnesota to Montana where I gather stone that was hand quarried and allotted for me. So it is in this spirit that I use the Name of the Nakota people and their indigenous language translation for the name “Eagle”. When you see these powerful and very sacred birds interact with the nature that surrounds us here in the Yellowstone Basin you can certainly grasp the Alliance that must take place between their very nature and Mother Earth in order for them to survive. Every Once and a while a project comes along that really finds a place in your soul. This is one of those times. On Monday I will be shipping this project to its new owner in Canada. A First Nations man will carry this flute with him on an upcoming journey that will take him across Canada over a two-year period. The idea for this flute came about after recently delivering a Native Styled pipe to the Western Ojibwe in Canada for which I was commissioned to craft. In a way this flute is a continuation of this pipe. The pipe which will be carried across Canada for the upcoming Tree of Peace Unity Walk will now have this flute as it’s companion. I have named this flute the “Spirit of the Pipe”. I shared a vision with my Elders, Clan Mothers, and Grandfathers. At the Council Fire they contemplated my vision, and in turn, they received a vision of a Sacred Eagle Pipe that was to be gifted to me. Through ceremony and reflection, Spirit guided us to Timothy. The Elders, Clan Mothers, and Grandfathers saw in his previous work, that it was evident that Timothy has a connection with the spirit of the materials he uses. This was very important to us as this Sacred Eagle Pipe will lead a Tree of Peace Unity Walk and the planting of 44 Peace Trees across Canada. This Unity Walk is the vision I received that will bring together First Nations Peoples and all Canadians for world peace and the healing of Mother Earth. When I received the pipe in a ceremony, I felt the energy of Timothy’s connection with the spirit in the wood and stone, in the making of this sacred pipe. Timothy is a master craftsman and artist who’s hands are blessed by the Great Spirit. In gratitude from myself and the Elders, Clan Mothers, and Grandfathers of the Cherokee, Iroquois, Ojibwe, and Cree of the Council Fire of this vision, we honor Timothy and his creation of the sacred pipe. I wanted to incorporate the spirit from the sacred pipe by attaching a mouth piece to the flute that was crafted from the very same stone the pipe was made from. In addition my plans were to craft a cabochon from the same stone to inlay into this flute. In my mind’s eye this addition of the stone to the flute would help carry the spirit of this pipe over to the flute. I had hopes that this flute would share in the very same journey as the pipe. As one draws in the smoke from the pipe in ceremony this same breath would give life through their playing of the flute. If this were to happen this would accomplish my vision for this piece. This six hole flute features a 1″ inch bore crafted from Old Growth Alaskan Yellow Cedar. It is tuned to the Key of D#. It features the Four Winds tuning holes and by most standard this is a large flute. Although I think it is the perfect size as its new owner like me is a large man and should have no trouble playing it. The theme for the pipe was that of the Eagle and so too we carried the same theme through to the flute by adding a fetish that represents a whimsical vision of the Eagle in flight. 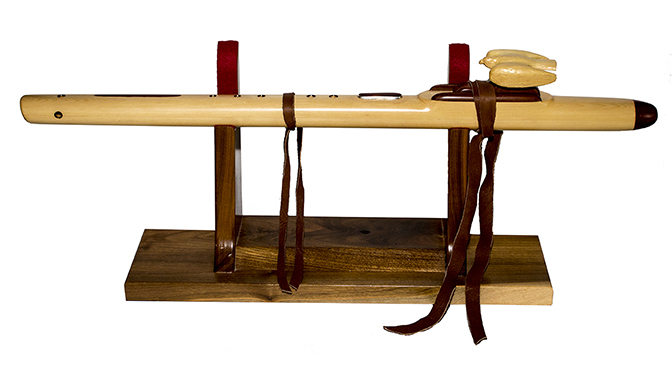 The fetish sits between two rails crafted from a special wood called Sapodilla. This reclaimed wood has much the same color tones as the pipestone. Island. The very same place the Alaskan Yellow Cedar used in this flute was harvested from several years ago.